As per a conversation tonight with my wonderful roommate, I've come to realize that there are but three liquids in life that make you stop, take that deep breath in, closing your eyes, tilting your head back ever so slightly, and make you utter "ahhhhhh". One, of course, is coffee. You wake up in the morning to the coffee machine ringing, pour that first cup, breathe in the aroma, and take a sip of what feels like the warmest, most soothing thing you've ever done for your body. The second is water. It's the source of all life, and there's nothing like downing a cold glass of water after running a quick 10k. The third, as most of you can hopefully guess, is beer. The carbonated, hoppy, malty, cold, taste invigorates your entire body, and sends it swirling through bubbly ribbons of refreshment. 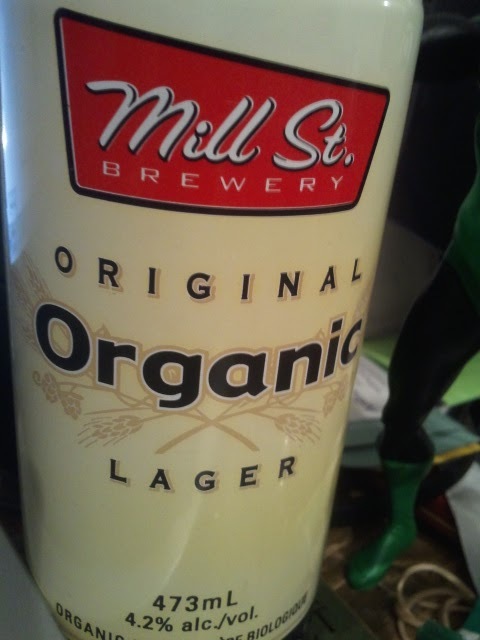 Tonight, my body was calling out for such a liquid, and I knew the Mill St. Organic in my fridge had my name all over it. You know that feeling when you're exhausted, and all you can even fathom is opening up a beer and sitting down, in utter silence, drinking it, and enjoying the calmness in the lack of sound and movement around you? To do that, all you want is one of your favourite beers - one with that recognizable taste. One that, in any bar or pub, you can order, and they'll know what you're talking about. That to me, is Mill St. Organic. When I want a recognizable, trustworthy, calming bev, and I'm in need of an "ahhhhhhh" moment, Mill St. Organic is what I order. Every time. So tonight, I write an Ode to Mill St. Organic. It's been a long time coming, and I've enjoyed each and every step of the journey.